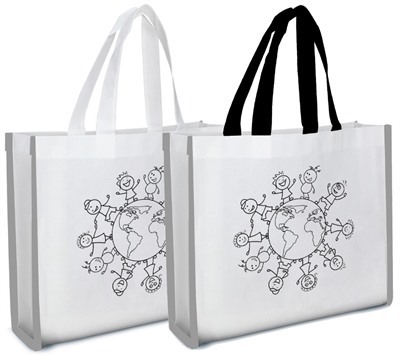 Promotional Colour-In Non Woven Bags are super fun for kids. Promotional Colour-In Non Woven Bags are super fun for kids. Get the kids creating their very own colour-in bag for holding toys, shopping or going to the beach. These fabulous bags have a design on the front that is custom made or chosen from stock designs! The bag comes with a 6-pack of crayons and has reflective piping accents. Complete the look with your business name and tagline.